Monday: Work, last day. Hutch from the comic is 10 time trial champ again, it’s not a bad read. Got to finish his book yet. Giro, best day yet. Popo went off on a lonesome bid and blew up less than 2km from the finish. Lance had to go back and pace Levi to the finish. Giro is blown for Astana so who are they going to work for now, Levi or Lance. Lance might own the team by the end of the week. Tuesday: No TT. Giro rest day. Spin then the gym. Cleaned the bike after last Wednesdays ride. Sorted the heater fan out on the car. Replacing a fan resistor pack is one of those jobs you only want to do once. Had a trip out on the Toy making the most of the sun. If I’d listened to the forecast I might of put it off but it was fine. Had a trip out on the Colnago Carbitubo, no hat, computer or bottle in fact zilch and it felt great. Thinking of running it in Keith Boardmans retro time trial series which is for straight bikes with no aero aids. Wednesday: Throwing it down come ride time meant it was time for a lie in and start another book. Read four chapters of Lance Armstrongs War then found the rain gear to head out to the Eureka. Bits of me were still sore from yesterday. Talk in the Cafe was of Wilco’s time for the 100 mile TT on Sunday, 3hrs 42 minutes, it doesn’t bear thinking about. Spoke to Keith Boardman about the 5 mile TT series, no disc wheels or tribars and no fancy helmets. Dave joined us and gave me an update on GPXX routes on Bikehike. The CTC mag was there with a OS Mapping software reveiw. Dave also told me about routable OSM maps. Home for the Giro, good to see Lance having a go. Had a look at the Astana website and they have withdrawn all the clothing for sale so it doesn’t bode well. Good to see over 100 have signed up for Stans Aqueduct ride, was an Audax, call it a sportiffe and triple the entry. Thursday: Spinning class then a short session in the gym. No comic in Tescos for some reason had me come out empty handed. Friday: Final fettling of the bike for Sunday. The Tri bars are coming off, the chain is getting a clean and the jockey wheel on the rear mech wants looking at. Giro in the afternoon. Bought a pair off BBB ceramic bearing jockey wheels. The Ultegra ones have a ceramic bush and although OK there was enough side to side play in it to have it replaced, Things are steadily wearing out, the rims are next, along with a front tyre. Going to have a play with BikeHike for Sundays ride. Saturday: Work. A busy day and it over ran. Saved a GPXX route with BikeHike for tommorows ride. Sorted the kit out along with some factor 50 as I’ve been indoors all day looking at the brilliant weather. It’s going to mean an early start but the bikes loaded up and I’m ready to go. Sunday : Aquaduct Challenge, 105 miles 3000 mtrs of climbing, hottest day of the year. What a day, did the full route which had me walking at one stage. An unbeleivable ride topped of with the fact that Dave Lloyd got lost and did not finish which made my day. 9 Hrs 24.59 for me which was a difficult ride. Must thank Stan for a great ride, got to revieve my Etape prep. The heat was there today, the climbs good. It’s opened up another level of cycling to me and I’m at the bottom of the pile. Update in a day or two. I did ask myself who on earth would want to be a professional cyclist. Why would you want to do what we have done for 20 days. Monday: The big day, doctors at 11 for a reveiw and a medical for my Etape entry. The Oval first for a hill session on an exercise bike. 30 mins at about 200 watts. Shower then to the waiting room. Blood pressure was up a bit so soon after the session but back down to 130/80 after a few minutes. This probably sealed it for me as it’s that long since I’ve been there that if you look at the record it says overweight and blood pressure problems. I’d also said I’d been taking home measurements and it had been about 130/ low Eighties. The fact that I was wearing a Heartrate monitor and knew what my max was helped. Was warned about the heat in July and with that I was done. It was a far cry from the early days when I dreaded the place. Signed form in hand it was back home to get it posted ASAP. Popped into Aldi for lunch and ended up Etape Caledonia was on the news as I came home from work lastnight as someone had sabotaged the route with carpet tacks. The plan now is to up the mileage in the hills and learn some French, giving it up at 13 wasn’t one of my wisest moves come to think of it. Went to see StarTrek at Vue it was great but at £7.10 a head you wouldn’t want to see a dud. Sweets work out at £12.40 a kilo or whatever unit they use. Great film, reminds you just how bad the first ones were with William Shatner as Kirk. Tuesday: Gym and a spin in the morning. Sort out a few thing later on with the Northend 14.1 TT in the evening. Now I missed out on this event last year as turned up to the wrong location as the club events don’t start at the CTT location. Never done a 14 miler before so it’s a first. Chased around like an idiot looking for the start only to find another club doing a TT, the Wrexham Fibrax 10. Co-opted the satnav to get me to the right location this time. Then drove the route to see what I was up against. It looked like a quick course sitting in the luxury of the car, I was thinking easy 23-24 mph on sections I hadn’t ridden. After a bit of misdirection I started at number 2. Mark was first off and it was remarkable how windy it was. Sections where I thought would be easy were hard due to a headwind. The first test is at Aldford bridge, here you come down the hill and hope there is no traffic. After the bridge I make time on a club ride with my minute man in the distance. Somewhere along the route there was a flagpole on a corner all this did was remind me I was turning straight into a headwind. I pass about 5 clubrun guys before I pass Mark, this was a bit disturbing as I was only about 3.5 miles in. There are a few climbs where I think I was letting myself down but it’s the same for everybody. Garmin logged the Heartrate at about 184 BPM max with a lot of it about 172 bpm. The time 38 minutes 8 seconds. Next in was Janet with a time of 37 minutes 58 seconds, beating me by 10 seconds. It’s been like this for the last 4 time trials. The lowest was 6 seconds I think. (i’ll check) At least it’s consistent. Been told it’s a good thing as she’s been doing it for years. Can’t quite justify a set of Zipp 808 yet. Vicky is improving and starting to catch up without any aero aids. Wednesday: Ride day, out to the Eureka for breakfast. I was in the queue when someone rushed it to call for an ambulace as someone had had an acident. It’s always a bit risky crossing to the Eureka but you wouldn’t want to become an A540 statistic. Ended up riding to Caerwys and coming back via Halkyn. The police had come into the cafe looking for witnesses but no one had actually witnessed the accident. I’d set out with Dave Newby chasing the big hitters that included the Springbok. This wasn’t going to last so I tagged along with Carols group going over the blue bridge. Met Steve another 705 owner and with Lionel that made 3 on the ride. Discussed maps and Routes as you do, now if you use MapSource it’s version of a route is different to what I do as it tries to autoroute you. Back to the ride, It split at Northop Lights as Lionel and co went up to the green (steep) once Ronnie was back with us Carol led us up to the A55 and then on to Pentre. It’s a bit of a lumpy ride and once at Caerwys we discover the Cafe is now a Delicatessen. 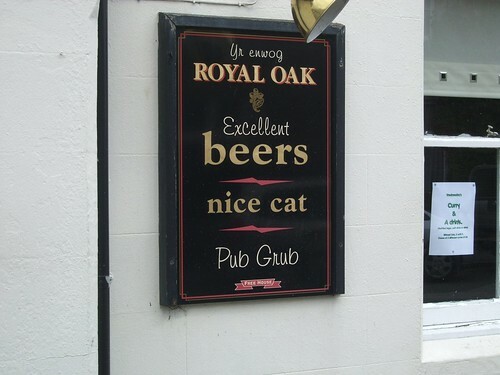 That’s a bit of a blow so we have a look at the pub that has a sign on the wall with ” Nice Cat” on it. Took a picture of it. Set off for the golf club, you think that with 3 Garmin 705 owners in a group of 4 we would have things sussed. Wrong. About a mile past the club we realised we were headinf for the wrong one. Lionel did a search, found the club and took us right to it. It was easily missed. Even when we got there there was no sign of the others. Good job the others persevered as the rest of the group was there and had already ordered. It’s a 9 hole golf course and looks nice. Food was good, didn’t see a menu but whatever asked for was provided. Scambled egg on toast with a cup of tea was £3. Rain was forecast between 1 and 2 and sure enough it arrived on time. Trouble was the top of the Halkyns is not the place to be when it arrives. The Discovery windshell was put on as we descended back via the green back to Northop. Hopefully this is all I’m going to need on the Ventoux if the weather turns, talking in the Eureka I’d been warned how bad it can get. As it was my hands in fingerless gloves(Aldi) were freezing. One of our group had put on the Aldi Lightweight Jacket and gave it a good reveiw on the way back. I couldn’t find mine in time for the ride. Good ride, bike was a bit of a mess along with myself as I had no mudguards but thats what it’s going to be like for a lot of us if the weather turns in July. Disscussed Routes with Lionel at the Eureka then rode home for the Giro. Cav won again, Armstrong had a turn on the front, all good stuff. Nearly missed Barbara’s spinning class at West Kirby being 5 minutes late. Gave it a bloody good go as half a days ride isn’t going to be enough in July. Barbara said I was wasting away but I’m down to 85 and a bit kilo’s today. Thursday: Got my timing wrong for the morning spinning class and missed the start by 15 minutes, only one class on a Thursday, it starts at 10.15 and I went to the gym think it was due to start at 10.30. Gym afterwards, shower and home. Another section of the Scenic exhaust started blowing, this is weeks after having a new back box for the MOT. I had toyed with the idea of scrapping it under the scrappage scheme but it’s had new tyres the exhaust is nearly all new. A large bill would see it off. Had to see the Giro time trial first though, well most of it. Downloaded the Aqueduct route uploaded it to Bikeroutetoaster.com then saved it as a Course to the Edge. Whatever happens on the Aqueduct I’ll be calling in at the world,s best Cycling cafe on a big ride. Junction of the B54407 and B4391. Was the highest petrol station in the UK I think, certainly in Wales. It’s a roller coaster of a ride to it with me locking it at about 40mph to avoid a straying sheep last year. Unbeleivable cake stop. Friday: Work, first day. Took half a pint of milk in for tea over the weekend only to have some light fingered person pinch most of it for cornflakes. Wouldn’t mind but it was Organic to boot. Cycling on ITV4 when I got in and then the Giro on Eurosport so no gym. Looked at carbon wheels on ebay with it finally dawning on me that the cheap ones all have crash damage. Sunday: Work. Lost out on a bidding war on Ebay item I was bidding on. Giro delayed on Eurosport when I got in for tennis. First in the Northend Handicap League by one point from Janet Hassell. It won’t last as now we are starting the 10 mile section. I’ve done 5 out of 6 events and your best 6 count. This year should be a bit better as some of the rides have been a bit low on riders, elevating my points. It’s possible to download Google Map finds to your Garmin 705 you must have Garmin Communicator installed. 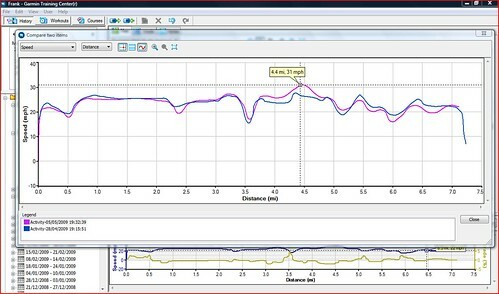 The following is from The Garmin Website and it does work. It seems to be related to Business finds. Its saved as a Favourite under WhereTo?/Find Places/Favourites/My Favourites. You can Delete this saved waypoint from the Edge without using a file delete. Question: How do I use Google maps with my Garmin device? The address you searched for will now be available in the Favorites list of your Garmin device. Google maps supports a lot of overlays including the OSM maps. It is an easy way of getting a destination into your Edge. looks like I’ve lost some of the html somewhere, I’ll try and get it fixed.